I awoke shortly before sunrise on a high mountain saddle. The air was cool as I peered out the door of my tent to see what awaited me. Panoramas to the south and west had drawn me to this mountain the day before and I had hoped to photograph them in the pastel light of dawn. On this morning however, the terrain laid curiously flat. A pale, filtered light seeped from the eastern horizon and the mountains, at rest beneath a veiling gray sky, sprawled in an indistinct mass. The atmosphere was quiet and somehow soothing. I climbed around on a northern spur of the mountain for much of that morning. And here by chance, I happened upon a small, vivid colony of lichen. In the shadowless white light it was dazzlingly colorful and instantly grabbed my attention. 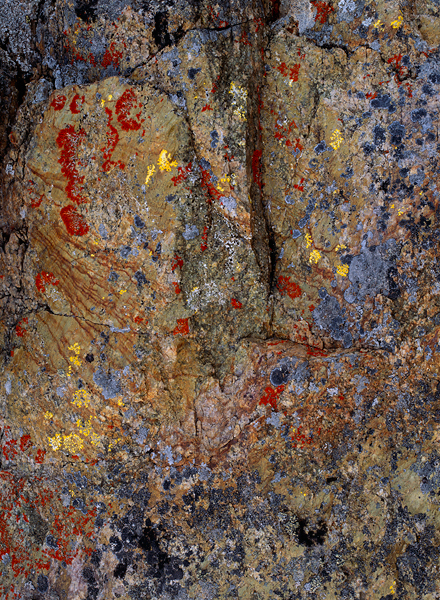 The surreal fantasia of colors and patterns in the lichen merged with exquisitely suggestive shapes in the lines and contours of the rock. I felt a wonderful exhilaration, all the more so because of my low expectations given the weather. Here was an astonishing slice of beauty hidden amidst the dark monotones of an overcast morning.